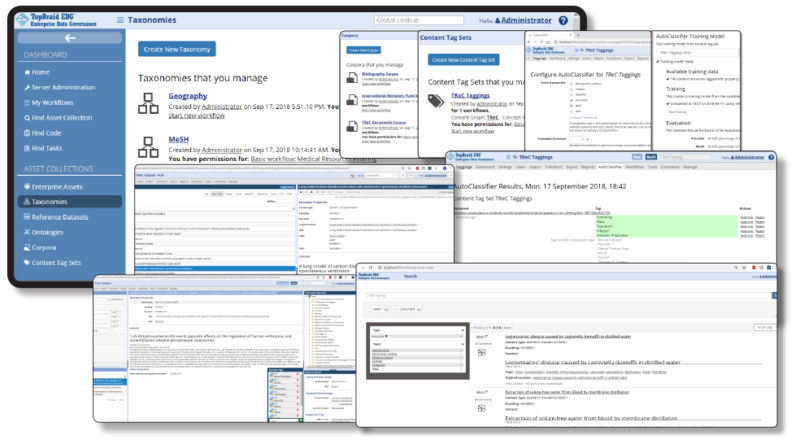 TopBraid Tagger and AutoClassifier analyzes your information assets – documents in many formats, web pages and the like – to identify the context and meaning of each asset. TopBraid Tagger uses state of the art AI to automatically assign most relevant tags and to further enrich the content. Auto-classifying your content resources by connecting them to relevant vocabulary terms delivers improved search, navigation and automates lifecycle management of content. TopBraid Tagger and AutoClassifier is a commonly used add-on module to TopBraid EDG-Vocabulary Management. Why TopBraid Tagger and AutoClassifier? Up to 80% of enterprise information is unstructured—it is information or ‘data’ in the form of presentation files, emails and documents. Not only does unstructured data represent a large proportion of enterprise data today, it is also growing faster than structured data. Enterprises are struggling to integrate unstructured and structured data within their existing information systems. Unstructured data should be actively classified or categorized. In order to do that, it should be easy for users to add metadata based on curated, controlled vocabularies. And, as much as possible, such metadata should be added automatically. This is the value delivered by TopBraid Tagger and AutoClassifier. How does TopBraid Tagger and AutoClassifier help? The output of Tagger and AutoClassifier is a set of metadata properties that establish named relationships between the content and specific terms in the vocabulary, and vice-versa. These relationships—or tags—can be used to enrich user searching and browsing and to integrate with and enrich other applications by managing metadata in the form of concept-to-vocabulary relationships. TopBraid Tagger and AutoClassifier makes it easy to create and manage these relationships. Tagger and AutoClassifier enriches information assets and adds metadata important for process automation. Upon extraction of metadata, rules enrich it further – inferring additional facts. Auto-classification, and reasoning processes can be integrated into business workflows to let intelligent machines processing automate routine tasks and escalate exceptions to human stakeholders..
Information governance best practices are enforced systematically and consistently. Outcomes are transparent and traceable – all information is processed in a consistent manner; decisions and outcomes are repeatable and fact-based. Use of taxonomies an ontologies ensures that language is harmonized, information silos are connected, and knowledge is aligned across the enterprise.